Who really is Dr Doom? Doctor Doom is one of the most powerful and popular villains of Marvel comics and is one of my all time favorite characters. Doctor Doom created a holiday in Latveria called Doom's Day to honor him. He decides what day the holiday will appear on. 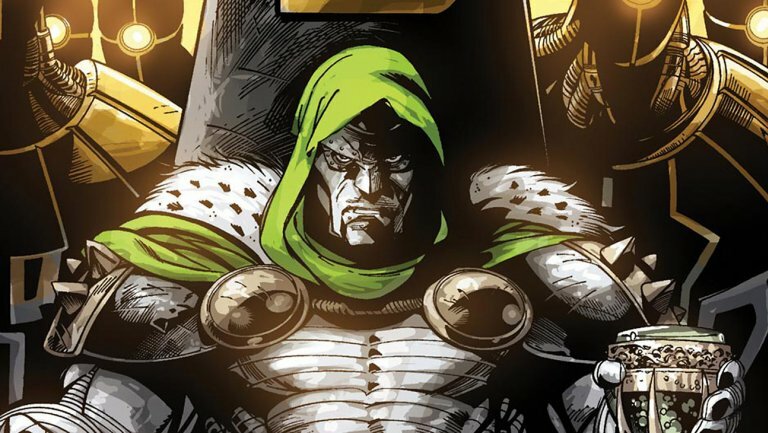 Wizard ranked Doctor Doom as the #4 top villain of all time, IGN ranked him #3. Doctor Doom has seemingly been killed a million times but never fully dies. This is often due to his legion of Doombots that take his place as doppelgangers. Doombots are an integral part of his lore and have even at times become characters themselves. One notable Doombot became partially sentient and began kidnapping cyborgs like Michael Peterson / Deathlok and Misty Knight in the hopes of becoming more evolved. Doom is a perfectionist and wears a mask to hide a small scar that marks his otherwise handsome face. The scar is from a failed experiment whole failure he blames on Reed Richards of the Fantastic Four. Check out the awesome Doctor Doom merchandise found on Amazon! Victor Von Doom AKA Dr. Doom is one of the most popular and powerful villains in the Marvel Universe. He was created at a special moment in comic's history. He was designed by comic legends Stan Lee and Jack Kirby to be a heavy weight villain in 1962. At the time Fantastic Four was blowing up and was pulling away super hero readers from DC. Marvel was beginning to believe they could compete with DC with their own super heroes as opposed to their previous focus on Westerns, Horror, and Dramas. Stan Lee and Kirby's run on Fantastic Four is a historical moment that both creates Marvel as we know it today and also alters the comic landscape forever. They begin to tell stories with more adult themes, more dynamic and deeper characters. They begin to attract the kids who are getting too old for the stories being written by DC and want a little more. Lee and Kirby are eye balling Fantastic Four #5 they do not want to lose the traction they have gained with comic readers and more over if they want to increase the insanity. 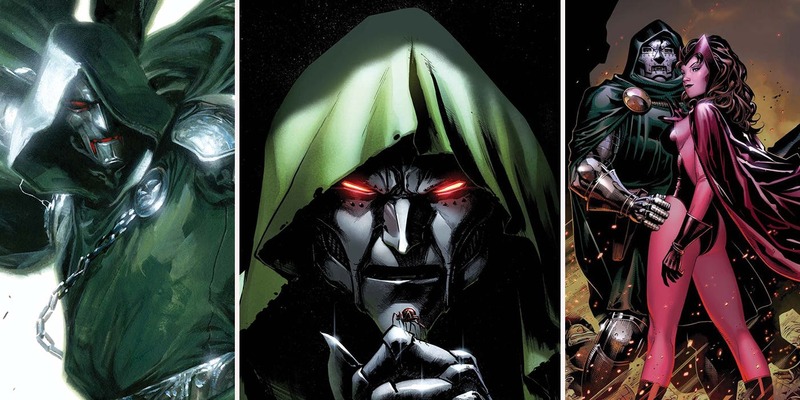 They decide to create an ultimate villain a real powerhouse that will push the Fantastic Four to their limits both physically and mentally, they create Doctor Doom. 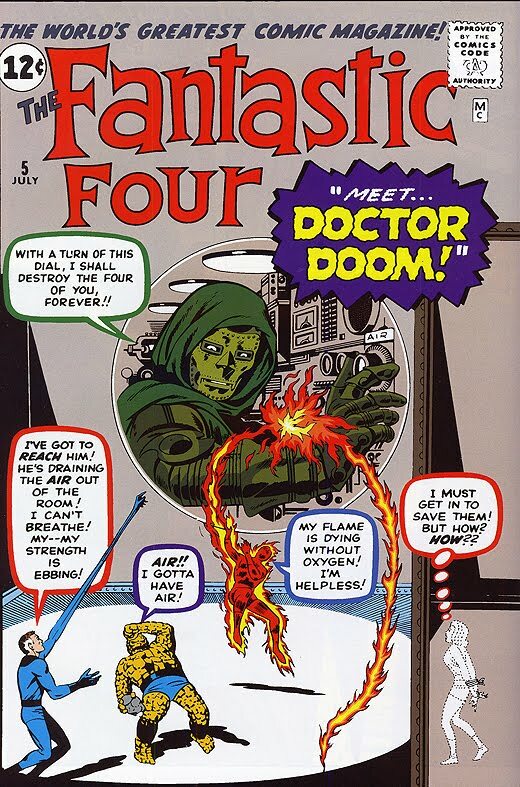 Doctor Doom mixes magical as well technological elements together opening up a variety of stories that can be told. He is modeled after Death, with a cowl that covers his head, and Steel Mask that is like a skull. The bits of humanity that can be seen beneath his mask from his eye slits remind the reader that he is in fact a man, and give him greater depth of motivation and feeling that non human characters lack. The result of this initial design and subsequent evolutions is that Doctor Doom has become one of the greatest and most dynamic villains of all time. Doctor Doom is one of the first villains that come to mind when you think of villains. He almost feels more generic now that so many have copied aspects of him. He remains as the ultimate symbol of the evil, megalomaniac, world conquering villain. Victor Von Doom is born to a gypsy family in the country of Latveria. His mother is a powerful sorceress and his father is a leader of the tribe and a healer. Doom's mother dies by being killed by the evil demon Mephisto. His father tries to hide his wife's magic from Doom in the hopes he does not follow her footsteps. The ruler of Latveria is a Baron and he calls on Doom's father to heal his ill wife. Dooms father find the Baron's wife to have incurable cancer and realizes that she will soon die. He prepares to leave with young Victor to escape the Baron's inevitable wrath. The wife dies and the Baron immediately begins to seek vengeance on the Dooms. Victor's father dies while embracing young Victor, he saves his son but is killed by the elements. A young Victor Von Doom vows to avenge his parents. He returns home seeking the means to acquire revenge and fatefully discovers the occult items of his mother. He studies the magic of his mother and becomes proficient in magical occult world and a protector of the Latverian gypsies. Combining technology with magic Doom is able to create fantastic devices that keep the Baron's forces away. Due to his fame in technology Empire State University asks a young Doom to study in the United States. He agrees to the offer and leaves his home and love Valeria behind to learn amongst the best and brightest. He quickly meets Ben Grimm and Reed Richards. He immediately dislikes both of them. Ben Grimm for being a fool, and Reed Richards for being more brilliant than himself. A failed experiment causes Victor to recieves a scar across his face, and he blames the failure on Reed. Doom leaves the University and travels. Eventually, he lands in a monastery where he conquers the monks and their sciences. He forges a suit of armor and becomes Doctor Doom. He conquers his old homeland of Latveria, and vows to conquer the world. In no time he once again confronted by his hated rival at Empire University, Reed Richards and the two become Arch-Nemesis. Dr. Doom's movie rights were owned by Fox through their Fantastic Four license. Dr Doom will appear in all of the Fantastic Four films. Fox has now owned by Disney which will allow Disney to integrate the Fantastic Four and X-Men characters into the MCU. 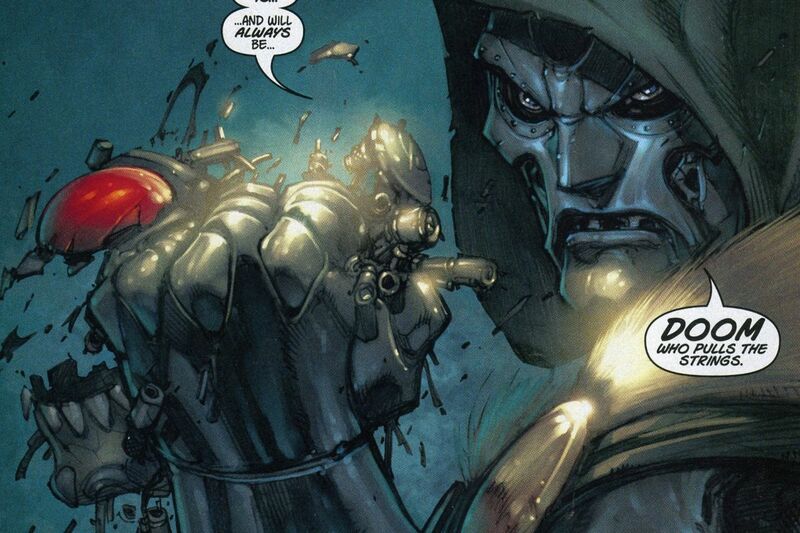 No official news has been released when Doom could appear in the MCU but speculation is rampant. It is revealed that Doctor Doom is Rabum Alal a character that seems to be the main antagonist in the Secret Wars storyline. Rabum Alal is revealed to be a future version of Doctor Doom who after learning about the incursions and the map makers traveled back in time with the all powerful Molecule Man. Somewhere during this journey Doctor Doom created a defacto religion with the Black Swans a people that worship him. The Black Swans then spread throughout the multiverse looking for worlds to be sacrificed in his name. Black Swan claimed that the incursions began at the birth of Rabum Alal. It is unknown whether she referred to the actual birth of Doctor Doom or when he transitioned from Doctor Doom to Rabum Alal. Doom uses the god like powers bestowed upon him as Rabum Alal to rebuild the Multiverse as a patchwork of worlds combined into one single world called Battleworld. He rules Battleworld as its ultimate monarch. In the end a group of heroes and villains defeat Doom and parts of the multiverse are restored. A new strikingly different Doctor Doom has appeared in the All New All Different Marvel Universe. This one does not where his cowl or mask at all. For a time Doctor Doom serves as Iron Man when Tony Stark is dead. 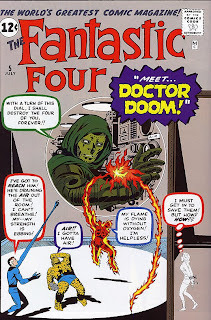 #DoctorDoom, #FantasticFour, #Marvel, #MarvelVillains, Doctor Doom, Fantastic Four, Marvel, Who is Doctor Doom?